From the Bay Area to the Bell Stage, Metallica need no introduction as the biggest band in metal and one of the most successful acts in all of music. Naturally, they arrived in Quebec City with the show to match, unleashing their sonic assault on the monstrous crowd for nearly three hours, with fireworks and lasers in no short supply. It wasn't as if anyone was complaining. The thrash vets opened with their most recent material, "Hardwired" and "Atlas, Rise!," at a near-breakneck pace, continuing with speedier-than-usual shots of "For Whom the Bell Tolls" and "Fuel." Though the crowd was receptive to the band's new tracks, the resonance of the hits couldn't be beat, with "The Unforgiven" and "Welcome Home (Sanitarium)" prompting the throngs of rabid fans to shout along. The band also had a few surprises up their sleeve throughout the set. The middle of the muscular "Now That We're Dead" saw the band leave their respective instruments to play large Japanese Taiko drums for a four-man solo, while Kirk Hammett and Robert Trujillo were spared a few moments to jam on Chic's iconic "Freak Out" riff. James Hetfield pulled off a costume change of his own, donning a denim vest adorned with punk patches for "Whiplash," before displaying his custom Quebec City guitar picks for the crowd on the video screen to raucous cheers. 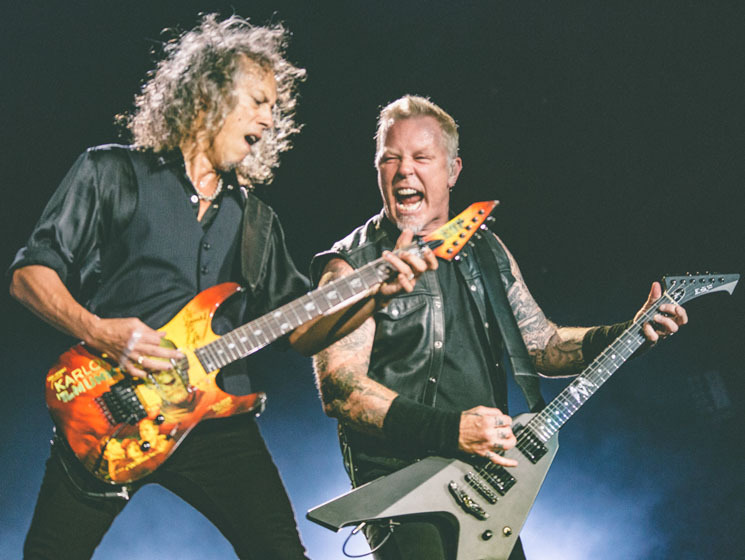 Once the dust and firework ash had settled following a hit parade that included "One," "Master of Puppets" and "Enter Sandman," Metallica reminded the audience that the band's first show in their town took place back in 1985. The latest chapter of their story as metal icons in Quebec shouldn't be forgotten anytime soon.